Geoffrey's latest book Busted Flush! 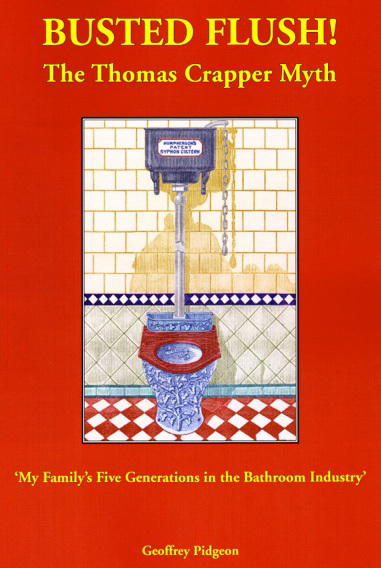 The Thomas Crapper Myth (sub-titled) ‘My Family’s Five Generations in the Bathroom Industry’ was launched at the Science Museum on November 5th 2014. A superb, wonderfully informative and fascinating insight into the history of one of the most important and essential items - we all take for granted. Geoffrey's exhaustive research includes 95 colour and black and white photographs plus well over a 120 documents and illustrations. "No one is better placed than Geoffrey Pidgeon to write this book, which is both a most marvelous memoir as well as a superb slice of social history. With their 'Beaufort' WC of 1884, his family produced the forerunner of the lavatory as we know today. Hail to Geoffrey Pidgeon, the King of the water closet world wide! At last too, some important myths are finally being laid to rest as part of the extraordinary story of fivegenerations of his family's all-important role in the evolution of the modern bathroom." 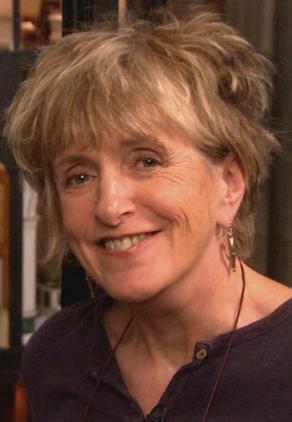 Lucinda Lambton is a writer, presenter and photographer. She has researched, written and presented 55 films for the BBC and 25 films for ITV including On The Throne - The History of the Lavatory. The Science Museum has a Family History Project. It produces Family History Films about the human stories behind some of the extraordinary objects in the Science Museum collections. Amongst these is Frederick Humpherson’s ‘Beaufort’ WC. Geoffrey Pidgeon (whose story is told in ‘Straight Flush’) says ‘Family and history are totally interlocked’ and as these films show, family historians can reveal the curious, quirky and the occasional tragic histories of our collections. Produced & Directed for the Science Museum by Bruce Eadie. Filmed & Edited by Paul Craddock & Bartek Dziadosz. 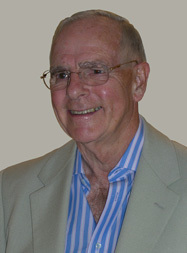 Geoffrey Pidgeon was born in Fulham in 1926. The family moved to Caterham in Surrey in the early 1930’s and he was educated at Caterham School. In 1940, the home was slightly damaged during the Battle of Britain being fought in the skies overhead. It was decided to move to Stony Stratford to be near to his father who was, working for MI6 (Section VIII) at Whaddon Hall some five miles west of Bletchley Park. He joined MI6 (Section VIII) in 1943 – the youngest member of the organization and initially helped make agents wireless sets. He then became part of a seven-man team known as Mobile Construction. Our task was to install our secret wireless gear in aircraft, MTBs and MGBs. This included test flights on the aircraft and on the ships out into the English Channel. Then, most important of all, the team made the wireless vans to provide ULTRA to our Military Commanders in the Field – on and after ‘D-Day’. There were seven built into British Army vehicles for the British and Canadian Commanders – such as Montgomery, Dempsey 21st Army Group and General Crerar commanding the 1st Canadian Army. For the US Army we used eight Dodge Ambulances stripped of their stretchers before fitting them too with our gear. These were for the likes of General Patton’s 3rd US Army, Simpson’s 9th US Army, General Bradley, and so on. Geoffrey left the unit in 1947 to join the family bathroom business retiring when he was 80. 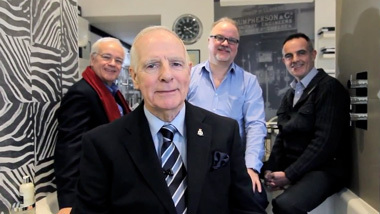 In 1966 he was persuaded by the Curator of the Wireless Museum at Bletchley Park to write about MI6 (Section VIII) and it was launched at Bletchley Park in 2003. Its title is ‘The Secret Wireless War’ – it is a large book of 416 pages with over 200 pictures and illustrations. It has been hugely successful. Possibly the most important UK wireless traffic in World War II was handled by a unit formed in 1938 by Richard Gambier-Parry head of MI6 (Section VIII) - to communications division of SIS. The book tells of its formation and includes diary entries by one of the 'founding fathers' recording the secret meetings that took place, and the assembly of its talented staff. It reports the earlier days of the original SIS wireless 'Station X' based in Barnes in south west London, and the building in a bungalow in Surrey by the strange name of 'Funny Neuk' - which turned out to be owned by Admiral Sir Hugh Sinclair - Chief of the Secret Intelligence Service. 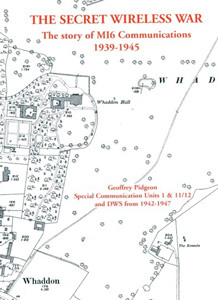 The unit’s wireless station installed at Bletchley Park is described and its later replacement at nearby Whaddon Hall – which then became the wartime headquarters of Section VIII. It documents the work of our agents in embassies abroad, and of those in German occupied territories; the story of Churchill's personal wireless operator, and there is the description by a German soldier of the Afrika Corps and his operating of an Enigma machine at Rommel's headquarters in the desert. The curious story of 'Black Propaganda' is told and the unit’s handling of Bletchley Park's ULTRA traffic out to Allied Army Commanders in the Field. Personal tales by those who were part of this most secret of units abound in the book and it is an important record of people and events that - it is no exaggeration to say - helped win the war. Whilst essential, the technical side of the tale has not been allowed to dominate the book which is profusely illustrated. It has 416 pages and over 200 photographs and illustrations.